In 1968, Britain’s The Sunday Times newspaper offered a trophy, named The Golden Globe, and £5,000 to the first person to sail singlehanded nonstop around the world. No starting date was specified, but several sailors, inspired by Francis Chichester’s one-stop circumnavigation in 1966/67, were already well under way preparing to accomplish such a voyage, and the prize gave them added impetus. Nine set out in 1968 but only one finished: Robin Knox-Johnston, sailing his 32-foot ketch, Suhaili. 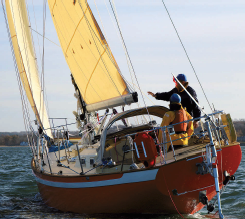 To celebrate the 50th anniversary of that event, Don McIntyre, who competed in the 1990/91 BOC Challenge, founded the 2018 Golden Globe Race to be sailed in good old boats equipped with good old gear and navigation systems as they existed in 1968. The race starts from Les Sables d’Olonne in France, home of the nonstop singlehanded Vendée Globe, in July of this year. Since Good Old Boat subscribers will receive this 20th anniversary issue in the mail at about the same time, we’ve included this special section on the race. Follow the race at www.goldengloberace.com. 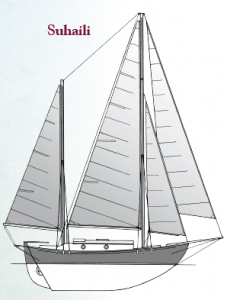 Robin Knox-Johnston’s Suhaili is a William Atkin Eric design. The 1968 Golden Globe Race was a challenge that drove competitors to glory, enlightenment, and insanity. Fifty years on, stories from the race have become deeply embedded in sailing lore. Robin Knox-Johnston, the race’s winner and only finisher, became the first man to sail solo around the world nonstop. On track to possibly win after seven months at sea, Bernard Moitessier quit the race, as he said, “to save my soul,” and continued sailing for a near-complete second circumnavigation. Competitor Nigel Tetley pushed his boat so hard that she sank only days from the finish line — all in a make-or-break bid to outrun a boat that wasn’t really there. That ghost boat belonged to Donald Crowhurst, the competitor who the world later learned spent all of his months in the race sailing idly in the Atlantic and radioing false position reports before finally taking his life as the threat of discovery loomed. The remaining five entrants dropped out along the way. 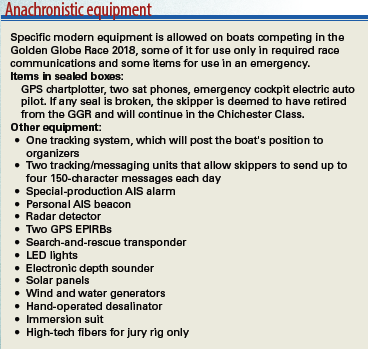 In the decades that followed, the Golden Globe race was never repeated, and around-the-world racing became something that the 1968 sailors would barely recognize. So, when the Golden Globe 2018 was announced, I felt a thrill of anticipation. Reading the race documentation was enough to produce heart palpitations: “30,000 miles nonstop . . . alone . . . with no outside assistance . . .” That description by itself is nerve-wracking, but this race is truly a re-creation of the 1968 race. Competitors’ boats must have been designed prior to 1988 and, in short, if Knox-Johnston didn’t carry it aboard his boat, today’s racers can’t carry it aboard theirs. That means no “GPS, radar, AIS, chart plotters . . . electronic wind instruments, electric autopilots, mobile phones . . . computer-based devices, electronic watches/clocks . . . digital cameras, satellite equipment . . . scientific calculators . . . watermakers, carbon fiber, Spectra, Kevlar . . .” Want to film yourself racing? Better find a Super 8 camera and film. This will be sailing stripped bare to its bones and, in my opinion, one of the most challenging and perilous competitions in the world today. But it’s one thing to be excited about a retro sailing race; it’s quite another to sign up for it. Despite having sailed 13,000 miles of blue water myself, I found the prospect terrifying. I wanted to know who these people were and why they were willing to risk life and limb to re-create a 50-year-old race. 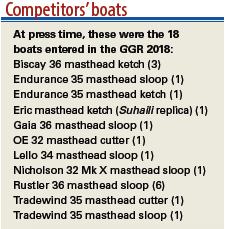 Of the 30 skippers who entered the race, 18 remained at press time, and range in age from 26 to 71. Among them are seasoned veterans, such as Jean-Luc van den Heede, a five-time circumnavigator and a father figure in French solo sailing, and passionate hobbyists, such as Australian Mark Sinclair, a hydro-graphic surveyor by trade who, on a recent voyage, forgot his celestial tables and had to rederive the formula to find his position. Of the four Americans who originally entered the Golden Globe 2018, only one, Istvan Kopar (65), will make it to the starting line under the US flag. Nabil Amra, a 42-year-old American-born Palestinian who works as a foreign-exchange trader in Minneapolis, will be racing under the Palestinian flag. 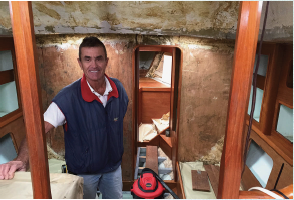 Istvan Kopar’s boat is a Tradewind 35. He painted her hull International Orange to make her more visible to shipping. I spoke with Istvan earlier this year. He was at his home in Delray Beach, Florida, but he was preparing Puffin, his Tradewind 35, at Seawanhaka Boatyard, Oyster Bay, New York. He says the distance is a major setback. “It’s a brutal drive, 22 hours usually,” he told me, from Delray Beach to Oyster Bay on Long Island. Istvan is no stranger to sleepless nights. Born in Budapest, Hungary, in 1953, and despite growing up in a landlocked country behind the Iron Curtain, he pursued a multitude of maritime careers, from merchant marine, to naval officer, to USCG- licensed commercial captain, to instructor trainer for US Sailing. He has logged more than 60,000 miles solo and, in 1990-1991, sailed his self-built 31-foot boat, Salammbo, solo on a one-stop east-about circumnavigation of the globe without the use of GPS, autopilot, radar, watermaker, or any heating device, setting a record in the process. Istvan then went on to skipper and win the 1996-1997 Hong Kong Challenge around-the-world race. In 1994, he moved to the United States, becoming a US citizen in 2000. Istvan’s first goal was to find a boat. 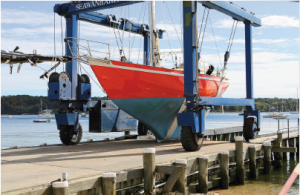 The race rules specify that qualifying vessels will be production boats between 32 and 36 feet overall, designed prior to 1988, and having full-length keels with rudders attached to the trailing edge. Race-approved boats include the Westsail 32, Tradewind 35,Vancouver 32/34, Baba 35, Cape Dory 36, Rustler 36, Hans Christian 33T, and Lello 34. 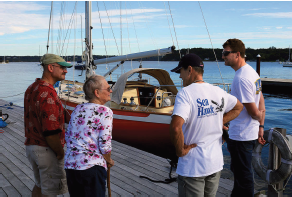 On Puffin’s launch day, October 10, 2017, after two years of refitting, Istvan and his team manager, Ian Gumprecht, were joined by Puffin’s former owner’s widow and son, Johanna and Matt Nally, who drove from upstate New York for the occasion. Istvan made significant upgrades to Puffin’s structure, such as bonding the bulkheads to the hull and deck, and took up the sole to get to the tanks. Yet another concern that absorbs Istvan’s thoughts are the requirements to qualify as an official entrant (all entrants are currently provisional). While the boats entered in the 1968 Golden Globe Race started from England, the start for GGR18 was moved to Les Sables d’Olonne, in France. In December, the French Sailing Federation expressed concern about the safety standards of the boats and both the age and experience of the skippers. However, the French maritime authority has since green-lighted the race and safety standards. The race organizers have issued a long list of safety requirements, which is an added challenge for competitors. “Day by day, we now have new unexpected require- ments that we have to comply with. It’s a huge burden,” Istvan says. Fiona McGlynn is a Good Old Boat contributing editor who, after two and a half years cruising from Canada to Australia, relocated to the Great White North and now lives in Atlin, BC. This summer, she’ll be joining the fun in France, reporting from Les Sables d’Olonne on the start of the 2018 Golden Globe Race. Fiona also runs WaterborneMag.com (previously Young & Salty) as a site dedicated to millennial sailing culture.